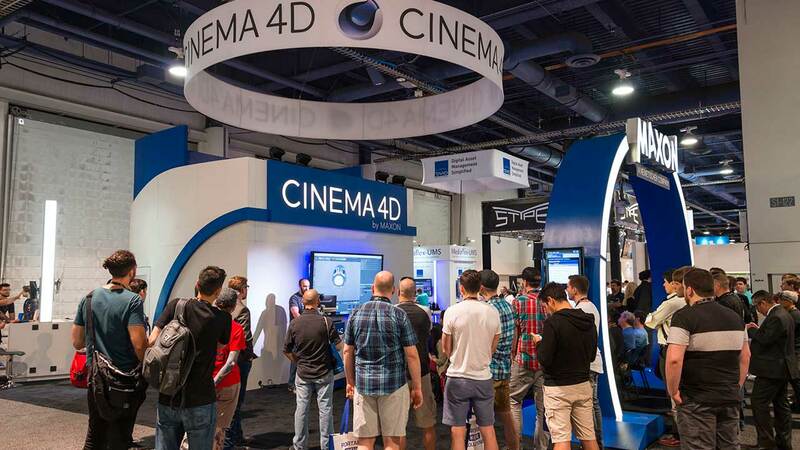 LAS VEGAS, NAB 2019 – SL#6324 – Maxon, the industry-leading developer of professional 3D modeling, animation and rendering solutions, is pleased to announce details of its exhibitor participation at the NAB Show, “…the world’s comprehensive convention encompassing the convergence of media, entertainment, and technology.” Maxon returns to NAB to showcase its flagship professional 3D software solution Cinema 4D, and the power and versatility the technology delivers to next-generation content creators. The NAB Show is held April 6-11, 2019 at the Las Vegas Convention Center. Maxon reprises its annual “First Day of NAB” press luncheon on Monday, April 8. This year, Maxon’s new CEO, David McGavran, will unveil the company’s near-term strategic goals to be more globally-focused, the latest news, and how Cinema 4D solutions and innovation continue to meet the needs of today’s 3D content creators. At the Maxon booth, #SL 6324, guest artists will demo Cinema 4D Release 20. The latest version of the software marks a huge leap in technology with high-end tools and features for VFX and motion graphics artists, including a node-based material system, new volume-based modeling tools, a very powerful CAD import and a major expansion of the MoGraph toolset. Cited by artists at top production studios worldwide for its intrinsic flexibility for conceptualizing and designing projects, the legendary MoGraph toolset in Cinema 4D was honored earlier this year with a Scientific and Technical Academy Award® for its significant impact on filmmaking. Maxon promises to deliver an incredible show experience to those attending NAB and those unable to attend in person. Each day of the show superstar artists from the motion graphics and visual effects community will present on the Maxon exhibit booth main stage. They will be sharing techniques, behind the scenes content and valuable insights from real-world projects to illustrate the capabilities in Cinema 4D that have inspired the creation of some of today’s most celebrated film, broadcast, multimedia and visualization projects. All presentations will stream live during NAB on C4DLive and be archived after the show on Cineversity. Full details on guest artist presenters and streaming schedules are currently available here. The annual Broadcast Education Association convention is co-located at NAB and features more than 250 sessions, workshops, and research geared to media production. Maxon returns to BEA and will host a booth to showcase how Cinema 4D graphics and animation education solutions benefit broadcast media industry educators, students, and professionals seeking to advance their professional 3D skill sets. The must-attend MoGraph Meetup, entering its second year, welcomes members of the motion graphics community to an inspired evening of hanging out and camaraderie with industry peers. Maxon is an event sponsor along with School of Motion, Motion Hatch, Greyscalegorilla, Video Copilot, Motion Array, Action VFX, aescripts + aeplugins, and Red Giant. Free to attend, RSVP required. The MediaMotion Ball, produced by volunteer organizations International Media Users Group (IMUG) and the AE-List, heads into its 22nd year at NAB as the premier and longest-running annual user group and networking event for post-production, production, motion graphics, and 3D industry professionals. Maxon reprises its sponsorship role as the exclusive provider of fine wines for the dinner event. Monday, April 8 | 10 a.m. – 6 p.m.
Tuesday, April 9 | 9 a.m. – 6 p.m.
Wednesday, April 10 | 9 a.m. – 6 p.m.
Thursday, April 11 | 9 a.m. – 2 p.m.
To schedule a media briefing opportunity with David McGavran during NAB, please contact Vicky Gray-Clark, Ambient PR, (408) 318-1980, vicky(at)ambientpr(dot)com, or feel free to stop by the Maxon booth # SL6324.